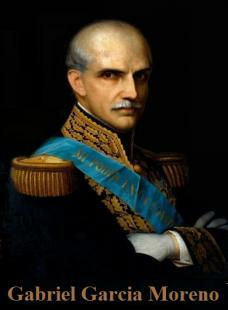 Moreno was more than willing to put his country under a concordat which expressed the theocratic doctrines of Pius IX’s Quanta Cura and its appendix, the Syllalbus of Errors. Pius IX stated that separation of church and state was a dangerous error (§55), that freedom of conscience was “insanity” (§3) and that the Church had the perfect right to use force (§24). This concordat is written accordingly. The second-last clause goes so far as to cancel all Ecuadorian laws which might conflict with it and stipulates that the concordat is to govern Ecuador forever. Today no concordat would be that frank. The 2004 Slovak draft concordat tried to achieve the same end less obtrusively by bringing in a separate piece of legislation: a constitutional amendment that gives Vatican concordats precedence over the country’s laws. ― For the President of the Republic: His Excellency, Monsignor Ignaçio Ordoñez, Archdeacon of the Cathedral Church of Cuenca in the same Republic, etc., etc., and Minister Plenipotentiary to the Holy See. This concordat refers often to the Council of Trent (1545-1563) whose “main object was the definitive determination of the doctrines of the Church in answer to the heresies of the Protestants.”* The laws or “canons” enacted by Church Councils, together with papal pronouncements, were organised into the first Code of Canon Law in 1917. Subsequent concordats often refer to this “Canon Law”, but the Ecuadorian concordat, predating this, still cites specific enactments like those from the Council of Trent. The Catholic Apostolic Roman religion shall continue to be the sole religion of the Republic of Ecuador, and shall always be preserved there together with all the rights and privileges which it ought to enjoy according to the law of God and canonical enactments. In consequence, no other dissident form of worship or any society condemned by the Church shall at any time be allowed within the Republic of Ecuador. In every diocese which exists at present or which shall be created in the future, there should be a diocesan seminary, the supervision, curriculum and administration of which shall belong freely and exclusively to the diocesan Ordinary [bishop] according to the rules prescribed by the Council of Trent and other canonical laws. The Rectors, Professors and others taking part in teaching and administering such establishments shall be freely appointed and removed by the Ordinaries. The education of young people in Universities, Colleges, Faculties, public and private schools shall be in full conformity with the Catholic religion. The Bishops shall enjoy in the exclusive right of indicating books or texts for the teaching of religious knowledge, and also for religious and moral instruction. Furthermore, the Bishops and Ordinaries shall exercise with full freedom the right which belongs to them of prohibiting books contrary to religion and good morals; the Government also will keep close watch and will take the necessary measures to prevent the entrance into and diffusion of such books in the Republic. The Bishops shall attend to the duty of their pastoral ministry which is to prevent the teaching of any theory contrary to the Catholic religion and moral virtue. For this purpose, no one shall be permitted to teach in any educational establishment, whether public or private, Theology, Catechism, or Religious Doctrine without having first obtained authorisation from the diocesan Ordinary, who can revoke it when it shall seem opportune to him. For the examination of teachers in primary schools, the diocesan Ordinary shall always appoint a deputy for the purpose of enquiring into the religious knowledge and moral conduct of the candidates for examination, who shall not be able to enter upon the performance of their duties without the approval of the same diocesan Ordinary. Since the primacy of honour and of jurisdiction in the Universal Church belongs by Divine Law to the Roman Pontiff, the bishops, clergy and laity shall have free communication with the Holy See. Therefore, no secular authority shall have the right to place obstacles to the full and free exercise of the aforesaid communication by forcing the bishops, clergy and laity to act through the agency of the Government in order to approach the Roman See if occasion arises, or by subjecting Bulls, Briefs or Rescripts of the Apostolic See to the Government’s exequatur. The ecclesiastical Ordinaries of the Republic shall have full freedom be free to govern their dioceses with full liberty, to assemble and hold Provincial and Diocesan Councils, and to exercise the rights which belong to them by virtue of their sacred ministry and of the canonical arrangements valid and approved by the Holy See, without anyone being allowed to hinder them in carrying out their decisions. Furthermore, the Government of Ecuador will provide the Bishops with its utmost assistance and support, whenever it shall be required, principally when it shall be necessary to oppose the wickedness of those men who endeavour to pervert the minds of the faithful and to corrupt their morals. Appeals from sentences of the Ordinaries to the secular authority (commonly called recursos de fuerza) shall be abolished. As regards the execution of sentences pronounced by the usual ecclesiastical tribunals, it shall be possible to make appeal only to the superior ecclesiastical tribunals or to the Holy See according to the procedure laid down in the Brief Exposcit (May 15, 1572) of the Supreme Pontiff, Gregory XIII, and in conformity with the canonical requirements, particularly those laid down concerning matrimonial cases by Benedict XIV in the Constitution Dei miseratione or, alternatively, it shall be possible to bring a case of nullity or of complaint before the aforesaid superior instances. The ecclesiastical judicial authorities shall pronounce their judgements without previously submitting them to the scrutiny of the lay assessors whom, however, they may consult, when they believe it necessary. Ecclesiastical Advocates shall be able to exercise the office of assessor in this class of judicial cases. All ecclesiastical cases, especially those concerning the Faith, the Sacraments (including matrimonial cases), morals, sacred functions, sacred rights and duties, whether by reason of person or of matter, except more important cases reserved to the Supreme Pontiff according to the decision of the Holy Council of Trent (Sess. 24, Cap. V, de Reformatione) shall be brought before the ecclesiastical tribunals. The same rule shall be observed in civil cases concerning ecclesiastics and in others regarding crimes included in the Penal Code of the Republic. In all judicial cases which may be within ecclesiastical competence, the civil authority shall furnish all help and assistance to enable the sentences and punishments pronounced by the ecclesiastical judges to be observed and put into effect. The Holy See permits ecclesiastical persons and property to be subjected to public taxation in the same way as the persons and property of the other citizens of Ecuador are subject to it, provided, however, that the civil authority consults the Church to obtain its consent whenever coercion shall be necessary. Seminaries, property and objects directly destined for Divine worship, and charitable institutions shall be exempted from such taxes. Out of respect for the majesty of God, who is the King of kings and Lord of lords, the immunity of religious places shall be respected so far as is compatible with public security and the requirements of justice. When necessary, the Holy See consents that the ecclesiastical authority, parish priests and superiors of the religious houses may, at the request of the civil authority, give permission for refugees to be taken out. As the proceeds of the tithes are destined for the upkeep of Divine worship and of its ministers, the Government of Ecuador binds itself to preserve this Catholic institution in the Republic and His Holiness consents that the Government should continue to receive a third part of the proceeds of tithes. The two authorities (civil and ecclesiastical) shall come to an agreement about the collection and administration of tithes. By virtue of the right of patronage, which the Supreme Pontiff concedes to the President of Ecuador, the latter shall be able to propose suitable priests for the archbishoprics and bishoprics according to sacred canonical procedure. To this end, when a vacancy in an episcopal see falls vacant, the archbishop shall ask for the votes and opinions of the other bishops about filling the vacancy; if the archepiscopal see falls vacant, the senior bishop in that region shall collect the votes and shall present a list of three candidates at least to the President, who may choose one of them and present him to the Supreme Pontiff for the conferring of canonical institution according to the form and procedure prescribed by the sacred Canons. In a case where presentation by the bishops is not made within six months, for whatever reason, the president of Ecuador shall have the authority to act by himself and if he has taken no action within three months, the election shall be reserved to the Holy See, as the President himself has requested. To this effect, the Government or, failing that, the ecclesiastical authority shall report to the Holy See as soon as those periods have expired. The persons presented, however, shall not be able to engage in any way with the discipline and administration of the churches without previously receiving Bulls of canonical institution. In the creation of new bishoprics, the President of the Republic shall, on the first occasion, present the new bishops directly to the Holy See. Similarly, His Holiness concedes to the President of the Republic the right of naming suitable ecclesiastics to benefices of a Cathedral Chapter or to offices, canonries or functions therein with the exception, however, of the highest dignity which shall be at free disposal of the Holy See, and with the exception also of prebends which are not part of the concursus, namely those falling vacant in the months of March, June, September and December; these shall be at the free disposal of the bishops. The offices of Doctor, Penitentiary, Professor and the rest of the concursus shall similarly be provided for by the bishops only, after they have made examinations according to canonical requirements. Finally, if in any Chapter does not contain the number of Chapter members fixed in the Bulls of creation of the respective dioceses, the bishop shall be entitled, immediately or when funds shall be sufficient, to create the benefices which are lacking, and provision for them shall be made in conformity with the procedure set forth in the present Article. With respect to the provision for parochial benefices the Ordinaries, in compliance with the rules laid down by the Council of Trent, shall present to the Government a list of three suitable ecclesiastics, on one of whom the parish may be conferred; the President, whether directly or by the agency of his delegates in the provinces, shall choose one of these three. In a case where the Government for special reasons should demand a further three candidates to be proposed, the Ordinary shall have the authority to provide such a list, on condition that it shall in no way be possible to reject this second list. If it becomes necessary to make territorial divisions of parishes, this can be done by the bishops in consultation with the local civil authority. During the vacancy of an episcopal church, its Chapter shall freely elect a Vicar Capitular, within the time and according to the form prescribed by the Council of Trent, without it being possible for anyone to reverse this election, once it has been made, or to proceed to another one; any custom, however ancient it may be, and of whatever kind it may be, which would be contrary in this respect to the enactments of the sacred Canons is hereby completely over-ruled and utterly abolished. The Holy See, in exercise of its particular prerogative, shall create new dioceses and shall make new delimitations in those at present existing; and taking into account the present extent of the dioceses among which the Republic is at present divided, the Holy See will, immediately on ratification of the present Concordat, confer on its own special delegate the necessary powers to proceed in consultation with the Government and the respective bishops to the territorial demarcation of the dioceses which can be conveniently created and to fix the endowments and salaries of churches, bishops, chapters and seminaries. The executive decree of May 28, 1836, on the abolition of taxes imposed in favour of the Church, shall be itself abolished; and the Holy See in view of the usefulness which will result from the present Concordat, and desiring to provide for public tranquillity and to remedy the evils caused in the country by the transfer of these taxes to the National Treasury, and acceding to the repeated requests of the President, decrees and declares that those persons who, during the period which has elapsed from the year 1836 until the present, shall have made or promoted such transfers, as also owners of the funds which have been acquired in this way and those who have in any way succeeded to the possession of the same, shall not receive, at any time or in any manner, the slightest molestation on the part of His Holiness or of his successors as Roman Pontiffs. With regard to the obligations contracted by the Government with its creditors because of the taxes transferred, the Holy See allows the Government to be free of all responsibility through payment of a tenth part (or less if the ecclesiastical Ordinary agrees) of both the capital transferred to the public treasury and also of the interest gained. To secure the payment of this amount, the Government shall assign to it a fourth part of the third which it shall receive from tithes; this shall be placed in the hands of the Ordinaries in order that it may be divided by them in proportional parts among their bona fide creditors, care being taken that the principal is capitalised in a secure and productive manner. In the future it will not be permissible for any possessor of taxable goods to transfer to the public Treasury the required capital, and those who shall try to free their assets from the taxes imposed on them, shall not be allowed to do so in any way without the previous consent of the respective Ordinary and by handing the required capital to the Ordinary by whose permission it may be submitted in case of necessity to a wise and equitable reduction; it being understood however, that in every case due regard must be paid to the interests of the Church. The Church shall enjoy the right of acquiring freely and by any legitimate title both the properties which it now possesses and those which it may possess in the future, which shall be guaranteed to it by the law. The administration of ecclesiastical goods shall be entrusted to persons designated by the sacred Canons, who alone shall examine the accounts and economic regulations. Goods of ecclesiastical foundations, of whatever type they may be, which belong to hospitals and other charitable institutions and which are at present not administered by ecclesiastical authority, shall be restored to it, so that without delay it can assign those goods to their rightful purpose. With regard to both old and new ecclesiastical foundations, no suppression or union shall be possible without the intervention of the authority of the Holy See, except for the powers belonging to the bishops according to the Council of Trent. In addition to the religious Orders and Congregations at present in existence in the Republic of Ecuador, the diocesan Ordinaries shall be able, freely and without any exception, to admit and establish in their respective dioceses new Orders or Institutes approved by the Church in conformity with the needs of their people; to this end the Government will lend its support. The Government of the Republic of Ecuador binds itself to provide all possible means for the propagation of the Faith by the conversion of pagans living in its territory; and to supply every assistance and help to the establishment and progress of the holy missions, which have been sent by the authority of the sacred Congregation for the Propagation of the Faith for this praiseworthy purpose. Other matters pertaining to ecclesiastical property or persons, of which no mention has been made in the Articles of the present Concordat, shall be regulated and administered according to the Canonical discipline existent in the Church and approved by the Holy See. By virtue of this Concordat all laws and decrees published hitherto in whatever manner and form in Ecuador are revoked in the respects in which they are contrary (to the Concordat); and the aforesaid Concordat is always to be considered as a perpetual law of the State. Therefore, each of the Contracting Parties binds itself, on behalf of their respective heads and their successors, to loyal observance of all and sundry of the component Articles. If in the future, any difficulty should arise, the Holy Father and the President of Ecuador shall confer with each other to obtain an amicable settlement. The ratifications of the present Concordat shall be exchanged within a period of one year, or sooner if possible. In witness whereof the above-mentioned Plenipotentiaries have signed and sealed the present agreement with their respective seals. Given at Rome on the 26th day of September, 1862. Giacomo Cardinal Antonelli. Ignaçio Ordoñez. 1. Derek Williams, “Assembling the ‘Empire of Morality’: State Building Strategies in Catholic Ecuador”, 1861–1875*, Journal of Historical Sociology, Vol. 14 No. 2, June 2001, p. 153. 2. Friedrich Hassaurek, Four years among the Spanish-Americans, New York, 1867, p. 132.